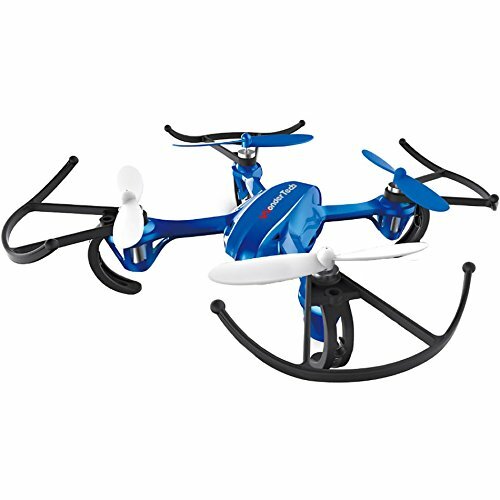 WonderTech Invader Drone RC 6-Axis Gyro Remote Control Quadcopter Flying Drone with LED Lights | Blue by WonderTech Invader at Open Drone. MPN: W202. Hurry! Limited time offer. Offer valid only while supplies last. Perfect for any pilot the invader drone is designed to be easy and fun to fly for any pilot at any experience level. Whether you are buying your first drone or you are an experienced hobbyist, the invader drone is sure to deliver fun and excitement with every takeoff. Headless mode and one key return features allow the pilot to locate the drone easily if line of sight is lost. Headless mode allows the operator to reorient the drone to the forward position no matter what direction the drone was previously facing. The invader drone also features one-key-return to easily call the drone back to the ground with just the press of a button. Easy to fly, even at night with bright led lights lights. The invader is the perfect drone for a first-time flyer or the experienced hobbyist. The drone comes packed with features including: an easy to use throttle limit button, a high quality performance remote control with a 3d flip 'n roll button to add to the action. Equipped with the latest tech including the best 6-axis gyro, 2. 4ghz remote control with spread spectrum technology for secure connection to the aircraft, integration with the latest drone piloting software. Signal interference will not occur even if there are multiple quadcopters in the area. If you have any questions about this product by WonderTech Invader, contact us by completing and submitting the form below. If you are looking for a specif part number, please include it with your message.